To find Least Common Multiple by using Division Method we need to follow the following steps. Step 1: Write the given numbers in a horizontal line, separating them by commas. Step 2: Divide them by a suitable prime number, which exactly divides at least two of the given numbers. Step 3: We put the quotient directly under the numbers in the next row. If the number is not divided exactly, we bring it down in the next row. Step 4: We continue the process of step 2 and step 3 until all co-prime numbers are left in the last row. Step 5: We multiply all the prime numbers by which we have divided and the co-prime numbers left in the last row. This product is the least common multiple of the given numbers. 1. Find least common multiple (L.C.M) of 20 and 30 by division method. Least common multiple (L.C.M) of 20 and 30 = 2 × 2 × 5 × 3 = 60. 2. Find least common multiple (L.C.M) of 50 and 75 by division method. Least common multiple (L.C.M) of 50 and 75 = 5× 5 × 2 × 3 = 150. Let us consider some of the examples to find lowest common multiple (L.C.M) of two or more numbers by using division method. Find least common multiple (L.C.M) of 120, 144, 160 and 180 by using division method. We can read the explanation and see below the L.C.M. of 120, 144, 160 and 180. First we write all the numbers i.e. 120, 144, 160 and 180 in a row separating them by a dash or comma. Then we divide by a least prime number i.e. 2 which divides all the given numbers. Now we put the quotient i.e. 60, 72, 80 and 90 directly under the numbers in the next row. Then again we divide by 2 and put the quotient i.e. 30, 36, 40 and 45 directly under the numbers in the next row. We continue the process and similarly we divide by 2 and put the quotient i.e. 15, 18, 20 and 45. Here 45 will remain as it is because we can’t divide 45 by 2. So we directly write under the numbers in the next row. Similarly again, we divide by 2 and put the quotient i.e. 15, 9, 10 and 45. Here 15 and 45 will remain as it is because we can’t divide 15 and 45 by 2 and we directly write under the numbers in the next row. 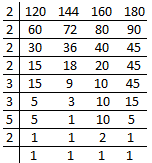 According to the explanation we continue the process and until all co-prime numbers are left in the last row. And atlast we multiply all the prime numbers by which we have divided and the co-prime numbers left in the last row i.e. 2 × 2 × 2 × 2 × 3 × 3 × 5 × 2 = 1440. Therefore, the product is the least common multiple of 120, 144, 160 and 180 is 1440.